Britain will have five drivers out of the 18 selected for motorsport's inaugural women-only W Series. Alice Powell, Jessica Hawkins, Sarah Moore, Esmee Hawkey and Jamie Chadwick came through four days of qualifiers at the Circuito De Almeria in Spain. The six-race series, which begins in May, has received support from a number of major F1 names. The season opens in Hockenheim, Germany on 3-4 May and the final race is at Brands Hatch from 10-11 August. The four other races take place at Zolder, Belgium, Misano, Italy, Norisring, Germany and Assen, Netherlands with a $1.5m (£1.14m) prize fund. Chadwick, 20, made history in August as the first woman to win a British Formula 3 race. 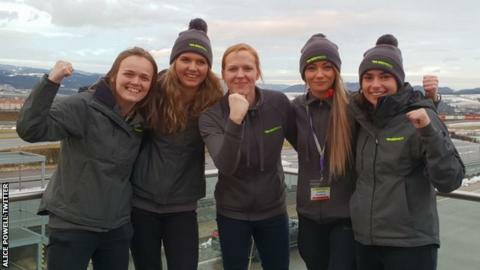 Catherine Bond Muir, the chief executive of W Series, said: "To the 18 drivers who did make it through, I say 'big congrats and very well done'. "I also want to mention our four reserve drivers, who didn't quite make the final 18 but all impressed our judges. They'll be disappointed, inevitably, but they're still part of the W Series family." There has been a 43-year drought for female participation in F1, after Italy's Lella Lombardi became the last woman to start in an F1 grand prix in 1976.